* 18+. New customers only. Certain countries only. GBP, EUR & SKR only. Min deposit and spend £5 on Bingo within 7 days of reg. Bonus for Bingo only. 2x wagering req apply. Bonus valid for 7 days. T&Cs apply. You can enjoy completely free bingo eFriday and Sunday at Ladbrokes Bingo. They have a whole room – the Attic – dedicated to free bingo with real prizes up to £300 but they also give you the option to Superbook your tickets to have a crack at a prize pot of £600! Make sure you are lovely and bubble within the chat rooms because Ladbrokes have recently released a terrific Roomie of the Month promotion. The Roomie of the Month will be chosen by the resident Chat Hosts. If you win you will receive free tickets to every single game! Usually an online bingo site has tonnes of staple promotions and fewer specials, but Ladbrokes turns that unspoken rule on its head! Whilst you can play free bingo all the time here and enjoy SOME staple promotions, pretty much all of their promotions have an expiry date. This means fresh promotions at a near constant basis – great for those who get bored easily! Ladbrokes have a terrific online bingo community in which you will find everything from Chat Games and a chance to get to know the Chat Hosts to handy Bingo Lingo guidelines! Anything to make your stay at Ladbrokes even better! £5 Mini Monday Bonus up for Grabs! Will you bag yourselves a £5 Bonus this Mini-Monday! Ladbrokes Bingo players, get ready for some mini-games action this Monday and you could be in with a chance of bagging a £5 bonus! That's right, today (Monday 17th September) you could be one of the lucky 50 people... read more..
£30,000 would be classed by most people as a live changing amount of money... What would you do with it? This coming Sunday night, you could turn your dreams into reality with Ladbrokes Bingo and their All Sorts of Fun promotion - This Sunday you could be playing to win a... read more.. This Bank holiday Monday Ladbrokes bingo have a big night of bingo games in store! So if you have nothing planned, and fancy a night in then you could be one step away from winning a share of £25,000. Play from 6pm on the 7th May throught to 10.30pm where every half an hour... read more..
As if Ladbrokes Bingo wasn’t giving away enough money... One of the best bingo sites have decided to up the ante even more by adding another £100,000 to their jackpot fund to celebrate spring this April. Their £100K Spring Sparkler event sure will put a spring... read more..
A whole night filled with All Sorts of Fun! This coming Sunday (22nd April) Ladbrokes Bingo will be hosting a night of Bingo with £30,000 in prizes. They promise there will be "All Sorts of fun!" With £30,000 in prize money to be won playing all your favourite... read more..
Every Saturday & Sunday in March Laddie wants to give your money back! Play Bingo with Ladbrokes Bingo between 7-9pm in the Lounge and you be able to play No Lose Bingo. 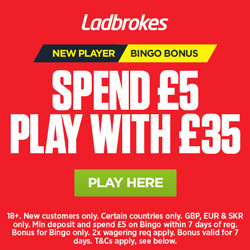 With £50 prize pools and 5p per ticket, if you don’t win you can’t lose because Ladbrokes will give... read more..
Ladbrokes Bingo love to keep their bingo fans on their toes – so they have created a perfect promotion to cater for absolutely everyone. In the middle of the month we can all get a little down – it’s nearly 2 weeks to payday! Luckily Ladbrokes Bingo has an... read more..
Ladbrokes offer a special £29 leap year bonus! This leap year if you are playing bingo with Ladbrokes you have the chance to claim a £29 bingo bonus! All you have to do is deposit and spend £29 this weekend (between Saturday 25th and Sunday 26th Feb) to qualify. Once you have qualified complete the simply claim... read more.. Displaying 1 - 10 of 21 posts.